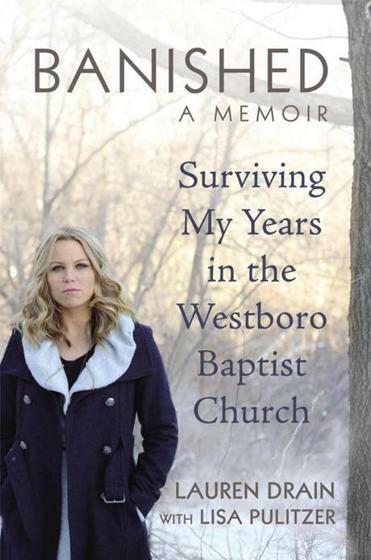 ”Banished: Surviving My Years in the Westboro Baptist Church" by Lauren Drain. Lauren Drain’s memoir is essentially about an abusive relationship — though not with another person. “Banished: Surviving My Years in the Westboro Baptist Church” details Drain’s involvement with the cult-like congregation led by Fred Phelps, whose members often picket events such as soldiers’ funerals carrying signs with hate-filled messages. The story surrounding Drain’s introduction to the church as a teenager is fascinating: Her father, a liberal atheist and aspiring filmmaker, wanted to make a documentary that would highlight the WBC’s ridiculousness. But the more time he spent with its members, the more his skepticism turned to understanding — so much so that he eventually relocated his wife and two daughters from Tampa to Topeka, Kan., to become full-time church members. Drain enthusiastically embraced her father’s new faith in order to get back into his good graces (having fallen out of his favor for chatting with a boy online). Co-authored with Lisa Pulitzer, “Banished” chronicles Drain’s years with the church until she was dismissed 10 days shy of her 22d birthday for being a “whore” — for talking to boys and communicating repeatedly with one outsider. While Drain offers some insight into the mentality of the WBC’s members, there’s nothing revelatory here. Because she’s writing as an outsider with the benefit of hindsight, it’s clear that Drain now finds certain aspects of the church (its isolationism and hypocrisy, for instance) shocking. But while these realizations appear to be mind-blowing for her, to anyone who is even passingly familiar with the Westboro Baptist Church, they are hardly surprising. One eyebrow-raising tidbit: Many members of the Phelps family are lawyers whose legal fees are paid by the state when they represent the church in lawsuits. “So being sued was kind of a win-win,” Drain notes. Drain leaves little doubt that the church members truly get an intoxicating, almost chemical “high” from picketing — but it’s not because they’re trying to get people to repent. (”We didn’t really believe their souls were salvageable,” she writes. Rather, a sense of superiority is the driving force behind all of the church’s actions, according to Drain. “When we staged protests, we were proving that we were right and righteous, and everyone else was wrong and clueless,” she writes. Though Drain clearly now feels a sense of remorse about her actions, as a reader, it’s often difficult to sympathize with her. Sure, as a high school sophomore she didn’t have much say about her involvement with the church, but at what point does youthful obsequiousness become willful ignorance? Drain is nearly 22 when she’s banished from the church, and though her complete abandonment by her parents is heartbreaking, many readers — especially those who don’t have a strong sense of faith — may be unwilling or unable to pity her lack of independent thinking. Even though she has started to question the church’s teachings, once things start to really go downhill with her family and other church members, Drain goes from indignant to contrite, begging for forgiveness and acceptance from the same people whose hypocrisy she derided pages earlier. In fact, Drain’s assertions occasionally provoke a sense of condescension. Regarding picketing immediately after Sept. 11, 2001, Drain (who was 15 at the time) writes, “I was too young and childish to care about and consider the feelings of people I didn’t know.” After the 2006 Amish school shootings, Drain (then 19) believes, “If it was God’s will that I spread His Word . . . then even if I personally found it distasteful and exploitative to picket the funerals of small children, I was in no position to say no.” Regardless of the degree of truth behind them, those are awfully convenient excuses to use when justifying such dangerous beliefs and behavior. As the tale of one woman’s struggle, “Banished” is a quick, interesting read. But for those looking for a clearer understanding of why something like the Westboro Baptist Church exists and what motivates its members, the book often raises more questions than answers.